The best thing about the arrival of grilling season is saying farewell to some dish washing. I use the grill as an excuse to not use the stove top or clean my cast iron pan. And, grilling is a lot of fun, a nice way to spend time in the garden and add a great flavor to meals. This Sunday I prepared a simple meal of Blackened Salmon on the grill, Caesar salad and a Sweet Pea and Prosciutto Crostini. Oh, and single barrel bourbon vanilla ice cream that will change your world. I’m a big fan of my friends at Savory Spice Shop at Friendly Center. Not only are they super knowledgeable about spices and blends – they sell great fresh spices that can make a big difference in your cooking. Since I discovered them, I’ve dressed up all kinds of dishes from simple oven fries to dry rubs for all kinds of meats. 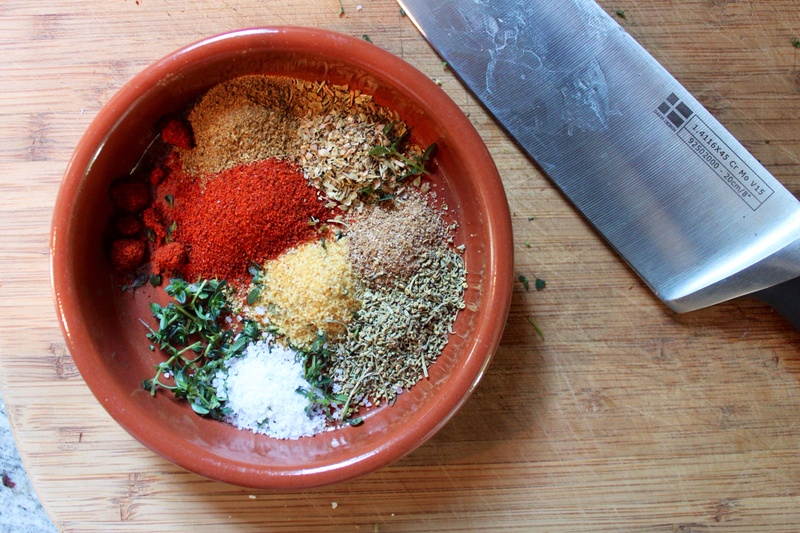 I made up this spice mixture for salmon and it was a great flavor addition and formed a lovely crust on the salmon. This is a very quick and healthy dinner for a weekend or weeknight! Fire up the grill! Prepare the rub my mixing all spices. Graciously coat the salmon. Grill to your desired temperature. Mix a salad of greens (I love torn romaine lettuce), cucumber, tomatoes and anything else you like. Top with salmon and serve with a piece of great bread.